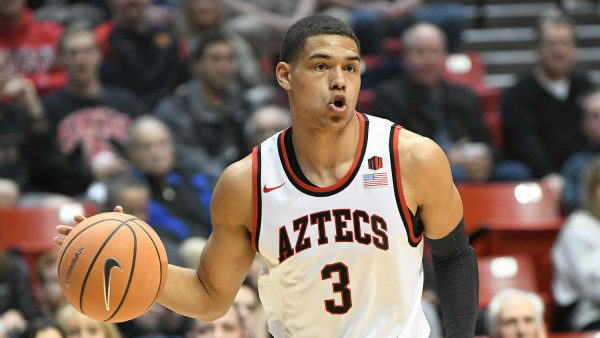 Before Saturday’s win against UNLV, the San Diego State men’s basketball team was in eighth place in the Mountain West Conference, after Wednesday’s win against Air Force, it is now in a three-way tie for fifth place. That could be crucial for the Aztecs (16-10, 8-7 MW) coming into the MW Tournament. The top-five teams get to skip the opening round of the tournament. On Wednesday night, SDSU showed that it could have what it takes to make it the postseason in the NCAA basketball tournament. The Aztecs led the Falcons (10-16, 4-10) by three at the half. After the half, freshman Matt Mitchell scored 11 points within four minutes and extended the SDSU lead, 43-28. Air Force never threaten after that. Mitchell scored a team-high 17 points. He was was 4 of 5 from beyond the key. Malik Pope had 13 points, Jalen McDaniels and Devin Watson both added seven points. Up next, SDSU faces San Jose State in San Jose. The winless Spartans are in the last place in the conference, which means the Aztecs could end the season with at least nine wins.